Ginger extract could prove a lot of more useful than simply tasting delicious and having a soothing effect on the stomach – it may also help to soothe the lungs for asthma sufferers. According to the researchers of a new study, asthmatics could benefit from more effective medications after ginger is added to them as parts of the peppery root interact with medicines known as beta-agonists. Laboratory tests showed how the ginger compound worked at accelerating the relaxation of airway smooth muscle (ASM) tissue samples, says lead researcher Dr Elizabeth Townsend, from Columbia University in the U.S. In the laboratory, the researchers exposed human samples of ASM tissue to the nerve signalling compound acetylcholine, which they knew would cause bronchial tubes to contract, preventing air flow and resulting in breathing difficulty. This is known as ‘bronchoconstriction’. Following this, the researchers they treated the samples using the beta-agonist isoproterenol in addition to either one of three different components of ginger (6-gingerol, 8-gingerol or 6-shogaol). It was noted that the 6-shogaol component appeared to offer the biggest effectiveness at increasing the relaxing effect of the beta-agonist and managed to dissolve protein filaments that are believed to constrict bronchial tubes. 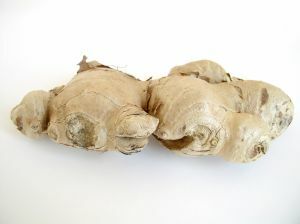 Interestingly, all three ginger compounds worked at suppressed a key enzyme that induces asthma symptoms. Beta-agonist medications primarily target the muscles around the airways – bronchi and bronchioles. After the lungs are irritated, the airways become narrower as muscles surrounding the airways tighten. Beta-agonists relax the muscles of the airways and thus widen them, making it a lot easier to breathe. Asthma and COPD are common lung conditions that are treated through the use of beta-agonists, with Ventolin Evohaler and AirSalb Salbutamol being two popular choices. Moreover, there are beta agonists that have other medical uses to treat conditions such as hypoglycaemia (low blood sugar), hypotension (low blood pressure), heart failure, and as an antidote to beta-blocking poisoning.